Bengaluru, 6 July 2015 – ITC Infotech, a leading global IT services & solutions company and a fully owned subsidiary of ITC Ltd recently concluded the ‘iTech 2015’, its first annual technology conference. As part of iTech 2015, ITC Infotech organized a 2-day Internet of Things (IoT) hackathon on July 4th and 5th, 2015, at its Bengaluru campus. Microsoft Azure was the official cloud partner for the event. The hackathon was organised for the brightest of minds comprising of IoT start-ups, Professionals & Developers and Students. A panel discussion on ‘Creating future ready businesses with IoT’ witnessed the likes of Ravi Gururaj – Chairman & Co-Founder of Frictionless Ventures; Dr. Srikanth Sundararajan – Venture Partner, Helion Venture Partners; Derick Jose – Co-founder & Chief Product Officer, Flutura Decision Sciences & Analytics and V V Rajasekhar – Senior Vice President, ITC Infotech and Chief Information Officer, ITC Limited. The hackathon provided participants with an opportunity to develop ideas into prototypes across a wide range of business challenges in the categories of smart retail, smart manufacturing, smart supply chain, smart agriculture. It also included an open category which permitted entries that were assessed on the strength of the business case presented and the viability for adoption and implementation. A total of 36 teams participated, which were sifted from over 700 entries received. The teams presented their solutions to business users and validated their ideas through live simulations of real business scenarios. The solutions were judged on whether it addresses a real business problem, if it is differentiated from alternatives in the market and if the solution was demonstrated successfully. 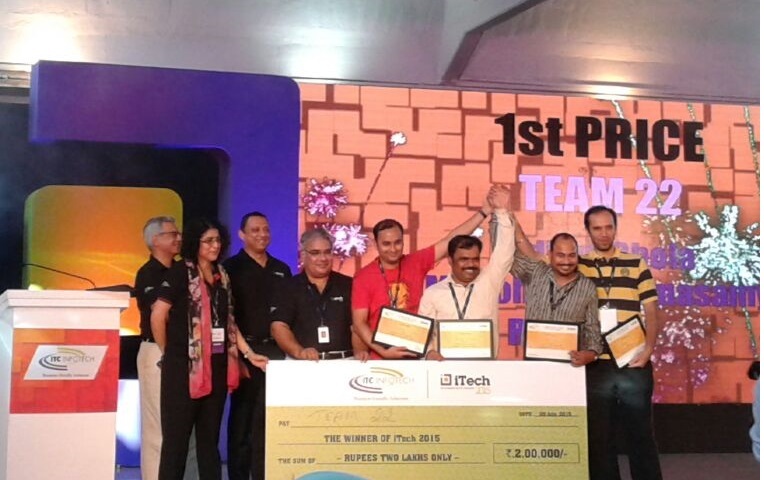 The winners, Team Aditya Bhola, Manoharan Ramasamy, Ravi Sharma and Hansraj were awarded Rs. 2, 00,000 for their project in the Smart Agriculture category for their innovative solution on smart irrigation. The market problem targeted by the team was water conservation with optimal crop irrigation and enhancement of crop productivity. The solution touches upon all facets of a typical IoT project namely sensors, edge intelligence and cloud computing that also empowers farmers with best practices and historical results. Two teams made it to the runners-up; Team Senthilkumar M, Balaji Babu TR and Anuj Duggal who built an IoT based farming land monitoring solution and Team Nitika Rajput and Tanmay Baranwal built a smart security monitoring system for agricultural use. Both teams were also part of the smart agriculture category and were awarded Rs. 1, 00,000 each for their individual projects. The platform’s focus is to leverage emerging and disruptive technologies to create business-ready solutions to address some of the most challenging problems faced by industry. The programme is part of the company’s larger initiative to encourage and nurture tech entrepreneurs and start-ups. iTech, an ITC Infotech initiative, is an annual technology conference. The platform will focus on leveraging emerging and disruptive technologies to create business-ready solutions, for addressing some of the most challenging problems faced by the industry. ITC Infotech will organise a 2-day IoT hackathon at its campus in Bengaluru on July 4th and 5th, 2015. 30 participants are shortlisted for this event which includes a school student. All these participants gets free IOT kit with sensors to explore their creativity. During the start of the hack there will be clear instructions about the hackathon and few technical insights are also given to the needy. iTech2015 theme is the “connected world” and “Internet of Things” This years challenges are spread across category of Smart Retail, Smart Manufacturing, Smart supply chains and Smart Agriculture. You are also welcome to submit in your IoT idea along with a business case in the ‘OPEN’ category, if it does not fall in the challenge areas mentioned above. The winners and runners up will be awarded a cash prize of Rs. 2 lakhs and Rs. 1 lakhs respectively.